It’s hot. 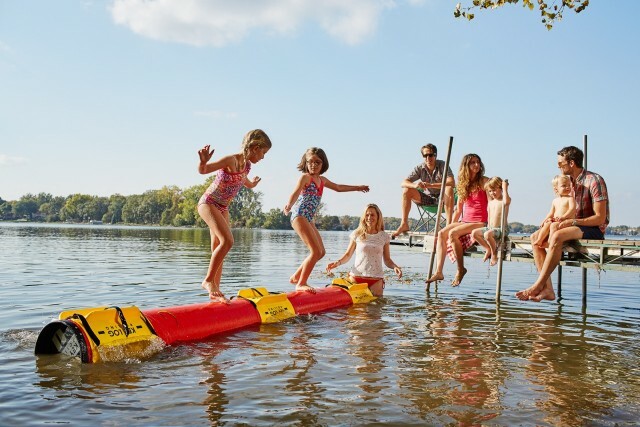 You might be looking for something new and fun to do in the water at the lake. Have you heard of the sport of log rolling? You know, the type that burly lumberjacks practiced 200 years ago in order to break up logjams on rivers? Up in Minnesota, with its 10,000 lakes, the Hoeschler family has been rolling logs since the late 1960s — when the matriarch, Judy Scheer Hoeschler, learned the skill as a teen in Hayward, Wis. Hayward hosts the annual Lumberjack World Championships, which includes log rolling. Judy won the first of 7 world championship log rolling titles in 1973. When Judy settled in LaCrosse, Wis., with her husband Jay, she persuaded the local YMCA to allow her to teach log rolling lessons on a 500-pound cedar log. The only drawback? Log rollers spun a bare wooden log, which required spiked shoes to turn. So, she did what any woman would do when confronted with a flooring problem. She carpeted the log, which provided excellent traction for rubber-soled shoes. Four children later, the Hoeschler family has been log rolling for years, and wanted to grow the sport internationally. Because of agricultural restrictions, the family could not ship cedar out of the country. Getting a 450-pound log to Europe proved to be a major hurdle, so the family talked about developing a lightweight, synthetic log. Five years later, Abby Hoeschler, graduated from college and in 2011 went on a search for engineers to create the perfect synthetic log. “I avoided math and science (she’s an Art History major) like the plague, so I was a little hesitant at first,” said Abby, about diving into the log rolling business. In the world of art, log rolling is portrayed as an American tradition. Abby now collects artwork – such as a Saturday Evening Post cover depicting log drivers on the river, posters, songs, an Old Spice ad and newspaper clippings – to illustrate the history of logrolling in America. She uses the artwork to decorate her office in Golden Valley, Minn. The Key Log works like this: a log that measures 11 feet, 8 inches can be filled with water from a garden hose, funnel or bucket– creating the proper buoyancy and spin, on a 15-inch diameter, that replicates a cedar log’s behavior on the water. The log idoes not require maintenance. You can roll it while wearing water shoes, or no shoes. A Key log can be emptied in about 5 minutes, and stored. A log will cost about $2,100. The log comes with Key Log Trainers – devices that wrap around a Key Log and slow it down. You can attach up to 3 Trainers to a log. “People really have fun, even the first time, when rolling a log,” said Abby. She believes log rolling is a fun way to fitness, while celebrating the rich tradition of America’s logging history.